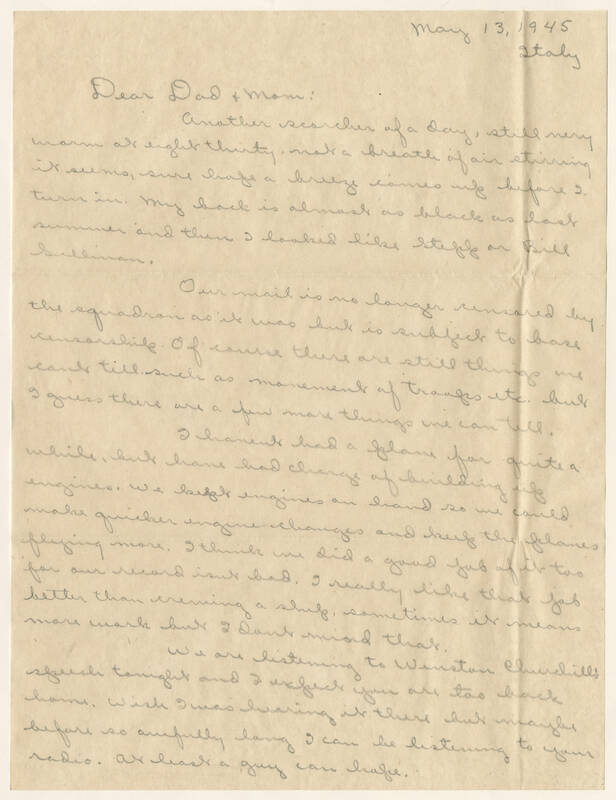 May 13, 1945 Italy Dear Dad & Mom: Another scorcher of a day, still very warm at eight thirty, not a breath of air stirring it seems, sure hope a breeze comes up before I turn in. My back is almost as black as last summer and then I looked like Stepp or Bill Sullivan. Our mail is no longer censored by the squadron as it was but is subject to base censorship. Of course there are still things we cant tell such as movement of troops etc. but I guess there are a few more things we can tell. I havent had a plane for quite a while, but have had charge of building up engines. We kept engines on hand so we could make quicker engine changes and keep the planes flying more. I think we did a good job of it too for our record isnt bad. I really like that job better than crewing a ship, sometimes it means more work but I dont mind that. We are listening to Winston Churchill's speech tonight and I expect you are too back home. Wish I was hearing it there but maybe before so awfully long I can be listening to your radio. At least a guy can hope.